When you make things for other people every day, sometimes you stop enjoying it. Last year, I was beginning to get bored of my work, because all I was doing was making things that other people told me to make. I mean, there was obviously creativity involved, people don’t commission things if they could find the same thing in a store, but using up all of my creative energy on other people was lame. I took a long hard look at what I had liked most about my job, and what I could change to feel that way again. I quickly realised that I missed having time to just create, without someone telling me what I had to make. I missed being able to make things for myself, just to see if they’d work. I missed finding new ways to do things, by failing several times, to make something I really wanted. So I made it my goal to make one new thing a week that was purely for myself. It could be anything – A dress, a hairclip, a necklace, anything – but it had to be just for me. Whether it was something small that I needed for a costume that night, or the costume itself, as long as I got to experiment, and make changes, and mess it up, and problem solve, I was happy. Plus I’ve come out of it with a heap of new stuff, which is always a bonus! This week I was low on $$$, but I really wanted some new hair flowers. I have heaps, but none that were particularly high-impact, and they need to be pretty high-impact to stand out against my blue hair. I wish I’d taken photos of the supplies before I pulled them apart, but I was too eager. 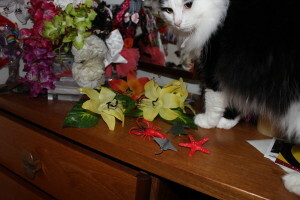 I got several $2 bunches of fake lilies from Look Sharp (best place in Auckland for cheap craft supplies) as well as some slide combs. 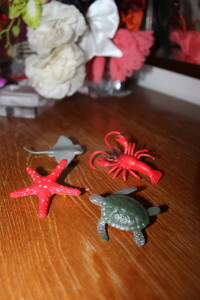 I also picked up a packet of plastic sea animals while I was there, because I’ve been searching high and low for a lobster brooch, so I figured if I could find a plastic lobster, I’d just make my own brooch. Turns out the other animals in the bag would make pretty sweet brooches too. I ended up testing a few different adhesive methods, and decided that a two-part epoxy would work best for what I needed, and would be the most durable, for both the hair combs and the brooches. I use a generic clear, 5 minute quick-set epoxy, because anything that gives you enough time to re-position things, before setting like a rock, is ideal if you’re prone to changing your mind. Anyway, enough chat, here are the things I made this week! 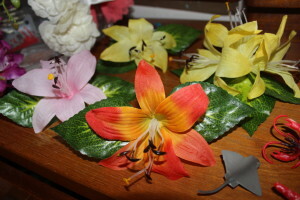 Some of the lily slide combs! 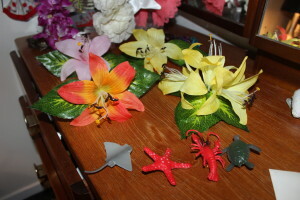 I ended up making a Lobster, a Starfish, a Stingray and a Turtle! 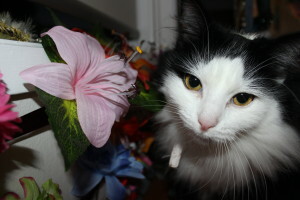 And here are some bonus shots of the Fluffy Cat, trying to get involved. 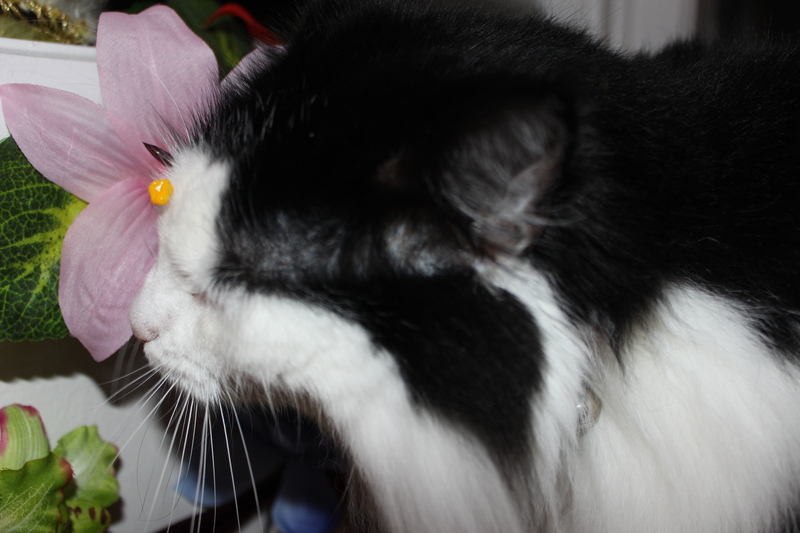 She loves eating flowers, real or fake, so I have to keep a keen eye on her or she’ll decimate my accessory collection.